Smith is Dean and Glen L. Farr Professor of Law of the J. Reuben Clark Law School, Brigham Young University. Dean Smith is a leading figure in the field of law and entrepreneurship and has done foundational work on fiduciary theory. He has also made important contributions to the academic literature on corporate governance and transactional lawyering. Dean Smith earned a JD from the University of Chicago Law School and a BS in Accounting from Brigham Young University. He has taught at six law schools in the U.S., as well as law programs in Australia, China, England, Finland, France, Germany, and Hong Kong. Before entering academe, Professor Smith clerked for Judge W. Eugene Davis in the United States Court of Appeals for the Fifth Circuit and was an associate in the Delaware office of the international law firm Skadden, Arps, Slate, Meagher & Flom. 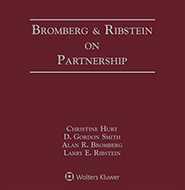 Bromberg and Ribstein on Partnership, Second Edition provides planning strategies, drafting tips, and other expert guidance you can put right to work in your practice. Bromberg and Ribstein on Limited Liability Partnerships, the Revised Uniform Partnership Act, and the Uniform Limited Partnership Act gives you today's most complete, insightful analysis of how recent statutory and judicial developments are transforming modern partnership law.